All four Gospels record the fact of Christ’s resurrection, but they say little about why it matters. To understand the resurrection’s importance, you must go to the rest of the New Testament, especially the epistles. “Delivered over” is an expression used elsewhere in the Bible for God’s judgment upon sinners, implying that Christ, who was without sin, became sin for us all, dying in our place. But the phrase, “He was delivered over to death for our sins,” says nothing about our being forgiven. “Justification” is a legal term, meaning that God, the Judge, declares you to be in the right, or “righteous,” in his sight. This is the chief article of the Christian religion, and it depends completely on the resurrection of Jesus. To be justified is to be forgiven and in a right relationship with God through faith in Jesus Christ, and that is why Easter matters. Jesus died for our sins on Good Friday, but our forgiveness became an accomplished fact on Easter Sunday. Rev. Bryan Wolfmueller, a Lutheran pastor, uses a football analogy to illustrate this. Many of us assume a touchdown is scored when the player with the ball crosses the plane of the goal line, but that’s not really true. A touchdown is scored for the team only when the official who has the best view of the play raises both arms to signal the touchdown. Only then is it official; only then are points awarded to the team. That illustrates what happened on Easter. In other words, it does sinners like ourselves no good for Jesus to cross the goal line and die for us on Good Friday unless the Father officially approves of his sacrifice on Easter by raising Jesus from the dead. In raising Jesus, God shows that he accepts Christ’s sacrifice for the sins of the world, and all who believe this good news are declared righteous before God. This means that Good Friday and Easter are like two sides of the same coin. They cannot be separated. Without the death of Jesus for the sins of the world on Good Friday, there could be no Easter. And without Easter, Good Friday would not be good at all. Good Friday is incomplete without Easter. It’s like half a coin: worthless. It would be just another day and Jesus would be just another forgotten victim of crucifixion. But Jesus was not forgotten. On the third day, God the Father raised Jesus from the dead, and in doing so, God has awarded righteousness to sinners, won forgiveness for all humanity, and elevated Jesus as the supreme object of faith. In thirty years of ministry, I’ve officiated at funerals for people of all ages, including infants who were pre-term and full-term. People often ask me how one does a funeral for someone you did not or could not know, including infants. 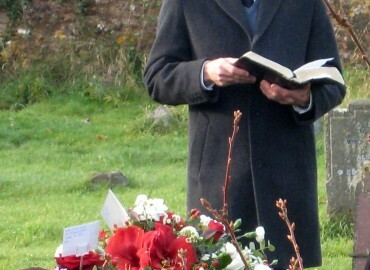 Although the occasion is one of deep sadness, the direction of the funeral and message is really quite simple. You preach Christ crucified and risen for all humanity, including that child. You focus less on the child and more on what God as done for every person through Jesus Christ. In fact, it’s easier to preach Christ at the funeral of an infant than an adult because the life story and “achievements” of the adult are often allowed to eclipse the achievements of Christ. Consider the account in Luke’s Gospel when parents brought their babies to Jesus that he might touch or bless them. This blessing was the act of God conferring grace upon the infants. One thing all should agree on is this: babies can do nothing but receive! Babies cannot earn, they cannot achieve, they cannot merit or actively acquire anything, nor are they in a position to decide. They must be given everything by the decision of another. And that is Christ’s point. Jesus cites infants, not adults, as illustrations of discipleship. Infants, pre-term and full-term, are the best example of what a disciple is, because they can do nothing but receive. It may surprise you, but the same is true for adults. Food, clothing and all that we need to support body and life are never earned by us but are solely the gifts of God. It’s the same with the forgiveness of sins and eternal salvation. Like infants, we are all passive recipients of what God alone gives through Jesus Christ. When an infant dies, pre-term or full-term, it’s not just the passing of a life, but the passing of the parents’ fondest hopes and dreams. That death is the consequence of sin which affects us all. Comfort for grieving parents can never be found in the presumed innocence of the child. Such innocence does not exist, but something far better does: God’s love for the world revealed in the death of his unique Son. I may not know how the infant felt about God, but I absolutely know how God feels about the infant, and the cross proves it! I cannot look into the child’s heart or anyone’s heart to know if faith is there, but I can look into the heart of God at the cross. There, I see God’s love for all, including for the child. There alone is true comfort in the midst of grief. Pastors and priests around the world speak those words to the faithful every Ash Wednesday. They are painful words to speak. We don’t like being reminded of our mortality. Advances in medical technology have enabled us to remove the dying from our homes to hospitals and hospice centers, where they receive the best possible care. And when death occurs, we hire professionals to make the body look more alive than dead, and we hire others to bury the remains. It has become customary and it can be helpful, but it also denies us the up-close-and-personal contact with death and burial that Americans of earlier generations could not avoid. We have managed to keep death and dying at a distance and hidden from view, yet it cannot be evaded. One hundred percent of us are terminal. 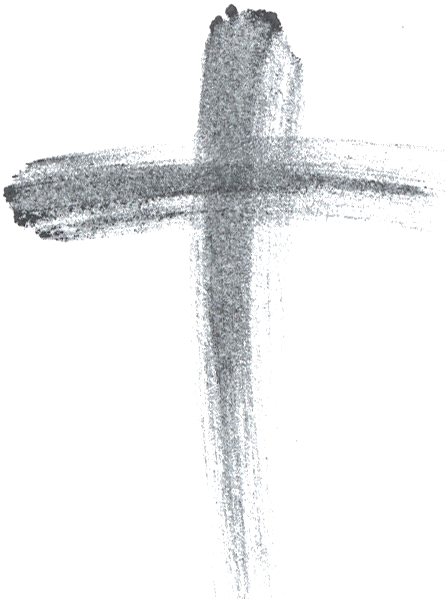 Ash Wednesday is one day in the Christian calendar when we intentionally confront that reality. Many evangelical Christians do not observe Ash Wednesday because it is not in the Bible. From a Lutheran perspective, to observe the day or not is a matter of Christian freedom, since it is neither commanded nor forbidden in the Bible. We choose to observe it not because we must, but because we are mortal. God was speaking to us also as children of Adam, for we were all in Adam when he sinned against God. Since death cannot be avoided, it must be confronted. The minister uses charcoal or ashes to make the sign of the cross on the foreheads of the faithful, as an outward sign of their inner repentance and sorrow over sin. God’s forgiveness is for sinners only, and God forgives sinners through the blood of Jesus shed for us. The minister then speaks God’s forgiveness to all who believe this Good News. God’s mighty hand imposed death upon us, but death serves only to shepherd us to the cross of Christ, where we see God’s solution to the sentence of death. The inevitability of death humbles us and causes us to seek the one who overcame death on Easter. Ash Wednesday brings us low emotionally and spiritually, but God lifts up the lowly. It is a day we intentionally confront the reality of our death, only to increase our longing for the Christ who is our life. Is it time to change the wording of the Lord’s Prayer? He has called for changing the Sixth Petition, “Lead us not into temptation,” saying that it implies God might do something he would surely never do—entice us to sin. The Pope has a point, and many Lutherans would agree, for the words are easily misunderstood. In fact, Pope Francis is in agreement with Martin Luther, the Reformer of the Church, on the meaning of the Sixth Petition. The devil’s goal is to test you to the breaking point, to see you fail so completely that you would die of despair and lose all faith in God’s mercy. The devil could do that, and God knows we deserve it. As sheep who are prone to stray, we should expect no more of a just God than to deliver us over to those sinful desires and situations that would soon overwhelm us. God owes us nothing, save the condemnation we bring upon ourselves when we turn from him. But Jesus Christ has died in your place for those very sins which would otherwise destroy you. The God who owes nothing freely gives all things to the world through his Son Jesus Christ. God will test you, but not beyond what you are able to bear. He tests you, not as an enticement to sin, but as a way of strengthening your faith. God could hand us over to those things, but he graciously does not. One important way the Lord delivers us from evil is by not allowing us to be tempted beyond what we are able to bear. As weak and fallible as we are, he keeps us from those temptations too powerful for us to withstand. The familiar English translation, “Lead us not into temptation,” captures this perfectly. Moreover, it is a spot-on literal translation of Christ’s words from the Greek. It need not be changed, nor should it be. It begs for explanation, not retranslation. Christ’s choice of words acknowledges both our vulnerability and our absolute dependence on the continuing grace of God. Why did God make us so liable to fail and to deserve punishment? If God knew we would sin and incur his wrath, why did he create us in the first place? Nowhere does he say, and no explanation does he owe. What Scripture does say is that God thought it fitting that he personally experience the deep distress to which he had subjected us all. This is vital to understanding the meaning of Christmas. Christians believe that God became fully human in the miraculous conception and birth of Jesus Christ and subject to all of our limitations. God, in the person of Jesus, subjects himself to life in a fallen world not so that he might gain knowledge of us, but that we might gain knowledge of who he is and of the extent of his love for all of us who are weak and liable to fail. He is a singularly unique God indeed who keeps his own rules and accepts his own consequences, not for any sins of his own, but solely for the sins of others. Sayers writes that the Egyptian god Osiris supposedly died and rose again and that the Greek poet Aeschylus theorized about a suffering Zeus, but these gods are said to have suffered in some mythical period of pre-history. In contrast, the Gospel narratives are anchored in history, in real space and time. Jesus was born in Bethlehem during the reign of Caesar Augustus and in the days of Herod the King, who sought to kill Jesus while yet a child. Some thirty years later Jesus was sentenced to death on a hill outside Jerusalem by the Roman Governor Pontius Pilate, who crucified him. God did this because sinners like ourselves can never ascend to God. This is why God, in his mercy, descends to us--in the womb of the Virgin Mary, in the manger, in death and the grave, and even today in the Holy Supper of Christ’s body and blood. At Christmas, God comes down and binds himself to his creation, becoming one with us, so that we might become one with God. In the person of Jesus, God not only becomes flesh and blood; he becomes guilty flesh and blood, taking humanity’s sin into himself, and taking his own medicine by dying in our place. Christ is born to suffer the death we had earned and which he had imposed on us, that we might know the full measure of his love for us all. As this year(2017) marks the 500th anniversary of the Protestant Reformation, let’s address some common myths associated with it. Myth: "Luther neither desired nor chose to leave the Roman church." He was excommunicated by the church and placed under the sentence of death by the Holy Roman Emperor because he refused to violate his conscience and deny the truth of his writings. Luther was a reluctant reformer who had no intention of starting another church. He advocated dialogue concerning abuses in the church, and for the rest of his life he called for a council of the church to address questions of theology and practice, to no avail. Myth:"The Reformation destroyed the unity of the Church." Actually, the unity of Christendom was shattered hundreds of years before Luther. The Great Schism, also known as the East-West Schism, was the event that divided Western (Roman) Christianity from Eastern Orthodoxy. This break was formalized in AD 1054, when Pope Leo IX of Rome and Patriarch Michael of Constantinople excommunicated each other, but both churches had been estranged long before then over issues such as papal authority. For several centuries, the pope had claimed supremacy over all other bishops, including those of eastern Christendom. Not surprisingly, bishops in the East disagreed, and the rift was never healed. Philip Melanchthon, a close associate of Luther, wrote that one might accept the pope as head of all Christendom by human arrangement rather than divine right, if only the pope allowed the preaching of the pure Gospel, that we are saved by grace alone, through faith alone in Jesus Christ alone. Myth:"The Reformers abandoned tradition and the teachings of the early church fathers." On the contrary, Luther and Lutheran theologians relied heavily on the writings of church fathers such as Jerome, Ambrose and Augustine to argue that the Gospel taught in Lutheran churches was no innovation. In contrast with the more radical reformers Zwingli and Calvin, Luther’s reforms were conservative in nature, preserving rites and traditions of the church that did not conflict with the Gospel. Myth:"Luther used drinking (tavern) songs in church." This is an oft-repeated statement by those wanting to validate the use of secular, pop-music in worship. They argue that if the great reformer found value in contemporary music, shouldn’t we have church services today featuring rap, heavy metal, reggae, techno, etc.? In fact, only one of Luther’s hymns (“From Heaven Above to Earth I Come”) was originally paired with a secular love ballad, but due to the tune’s association with non-sacred activity, it wasn’t long before Luther wrote his own tune for the hymn, which replaced the love ballad and became the standard tune which we sing today. Apparently, Luther has second-thoughts about pairing his hymn with a secular love song. Another myth is the so-called Luther quote, "Why should the devil have all the good tunes?" The problem is that scholars find no evidence of the quote anywhere in Luther’s writings. Rest assured, however, that the devil does not have all the good tunes. Luther believed the music of the church should proclaim Christ’s saving work with tunes that can be easily sung by the congregation and are free of overt, secular associations that could overshadow the Gospel message. Myths surrounding the Protestant Reformation are easily dismissed by keeping the following in mind: it was all about Jesus Christ and the centrality of his saving work in the life of the church and in the life of every member. Whatever obscured Christ, whatever undermined confidence in his saving death and resurrection, the reformers abandoned. Whatever proclaimed Christ and created faith in him, the reformers gladly retained.